Go to Detroit Athletic Co, online at detroitathletic.com, for all your Detroit sports gear. Detroit Athletic Company carries apparel, hats, collectibles and more from the Detroit Tigers, Detroit Red Wings, Detroit Pistons, and Detroit Lions. Find jerseys, women's apparel, ball caps, t-shirts, youth apparel, stadium artifacts, autographs, books, DVDs, CDs, ballpark souvenirs, and much more. So get something special for your Detroit team fan from Detroit Athletic Co, and get all the latest detroitathletic.com discounts, Detroit Athletic Co promotions, and Detroit Athletic Co coupon codes found here at RetailSteal.com. 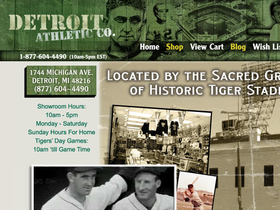 Detroit Athletic Co offers shipping in the United States via UPS or USPS and internationally via USPS. See site for more details. Save 10% on Detroit Red Wings gear using this coupon code at Detroit Athletic Co. Click here to shop. Enjoy free shipping from Detroit Athletic Co. Click here and save on purchases $100+. Save up to 70% on select apparel on sale at Detroit Athletic Co. Click here to save on merch from the Detroit Lions, Detroit Red Wings, Pistons, and Detroit Tigers. Save up to 20% on select Detroit Tigers sweatshirts from Detroit Athletic Co. Click here to shop now. Save up to $50 on sale items from Detroit Athletic Co. Click here to shop and save. Shop for vintage ball caps for as low as $16 from Detroit Athletic Co. Click here to shop today. Shop for Detroit sports photos from $6 at Detroit Athletic Co. Click here to shop now. Use our spring coupon code online at Detroit Athletic Co today to save $10 on purchases of $100 or more. Click link. Shop online at Detroit Athletic Co today and use our coupon code to save $10 on purchases of $100 or more.